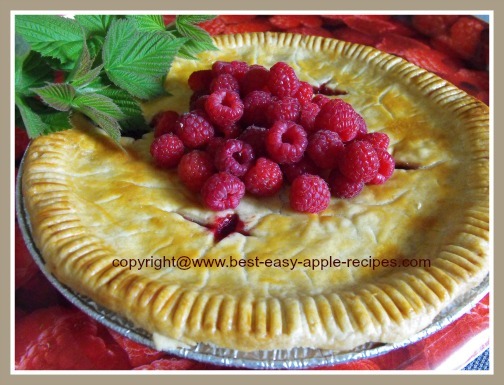 Make this Fresh Raspberry Apple Pie Recipe with apples and red or black raspberries to make a deliciously delicious homemade pie! This berry apple pie will not last long after you makes it, it's just THAT good tasting! An excellent choice for a Thanksgiving Pie or or a treat at ANYtime! In a bowl combine the sugar, flour and the salt. Fit the pastry into the bottom of the pie dish. Sprinkle about 1/3 of the flour mixture into the bottom pie crust. Add 1/2 of the prepared apples and 1/2 of the raspberries. Sprinkle another 1/3 of the flour mixture on top of the fruit in the pie dish. Add the remaining prepared apples and the remaining raspberries to the pie dish. Sprinkle the last 1/3 of the flour mixture on top of the fruit. Sprinkle a few drops of lemon juice on top. Cut the butter into small pieces, and distribute over the fruit. Dampen the edges, and add the upper pastry crust. Trim edges and crimp edges with a fork. Bake pie at 350° F for about 1 hour, or until fruit juices begin to bubble through the "vents" or "slits" in the upper pie crust. (I like to protect the pie crust edges from becoming too dark by using a pie crust shield after the pie has baked for about 30 minutes). Serve this raspberry apple pie warm or cooled with ice cream or whipped cream. As with most fruit pies, you can bake more than one pie and freeze them, unbaked in a sealed bag in the freezer for up to a few months.